I saw this on the girl talk blog for the Friday Funnies (if you don't read that one, you really should!) and just had to copy it and post it on mine. 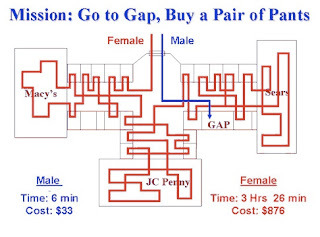 SOOOO funny--this is why WOMEN love to shop so much more than MEN!! PS- Penney's is having 70% off and the little boys Pj's (with shorts and pants to go with top) are around $5 per set! Long sleeved t's are $6. That's so funny-Dev, how do you know Gretchen? My brother, Jamy, used to date her at MBBC. I couldn't believe it when I saw her on your blog. what's going on dev? It seems like you haven't posted anything for days??? Hope everyone is doing great! Aim--new post coming up today--been slightly busy as usual! Its just a small world. I check blogs everyday, so definitely get something up already (Just kidding). It takes me forever and I only have one child. Talk to you soon.